The MAKO 334 CC ushers in a new era for MAKO-an era of empowered performance, elevated style, and enhanced fit and finish. 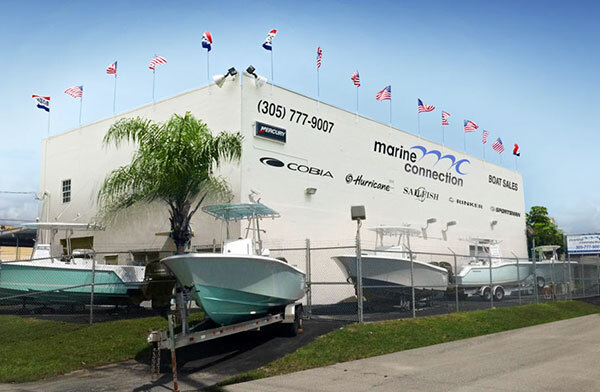 It's built to feed your passion for sportfishing in safety and style with an alliance of custom creature comforts and state-of-the-art technology. This advanced, spacious offshore craft offers unsurpassed flexibility in the interior plus the overbuilt durability that has made MAKO legendary for half a century. It's built on a hand-laid, 24 degree deadrise Deep V hull with a unique notched transom for top performance and improved efficiency. The 334 slices through the chop, rides dry and smooth, and has the range to handle any offshore quest. Standard: Far from a "Standard" offshore boat, it includes a full-featured Garmi electronics package, two 34-gal. baitwells with rounded corners and constant pressurization, a leaning post with freshwater sink, cooler, and a massive storage capacity, marine stereo, two 290-qt. in-deck coolers, a walk-in head and an inward-opening tuna/dive door. Our service department has performed a mechanical evaluation & water tested it and she runs out great - the motor has good/even compression on all cylinders. Factory Mercury warranty through 11/30/2019! Surveys and mechanical inspections are welcome. This boat can be yours for only $1699 a month and $59,348 down (with approved credit 5.99% annual percentage rate for 240 months)!